My first adventures on the Kanawinka Geotrail pre-date Pilchard by quite a few years But they also pre-date both owning a camera AND knowing that the Kanawinka Geotrail even existed!! Now I know the Geotrail connects 60+ significant sites across South-Eastern South Australia and South-Western Victoria in Australia’s first UNESCO Global Geopark – one of the largest regions of volcanic activity in the world. And seeing them all is going to take a longer time than we had available in Spring, 2013 – even though I’d had a head start going back nearly … well, never mind how long! 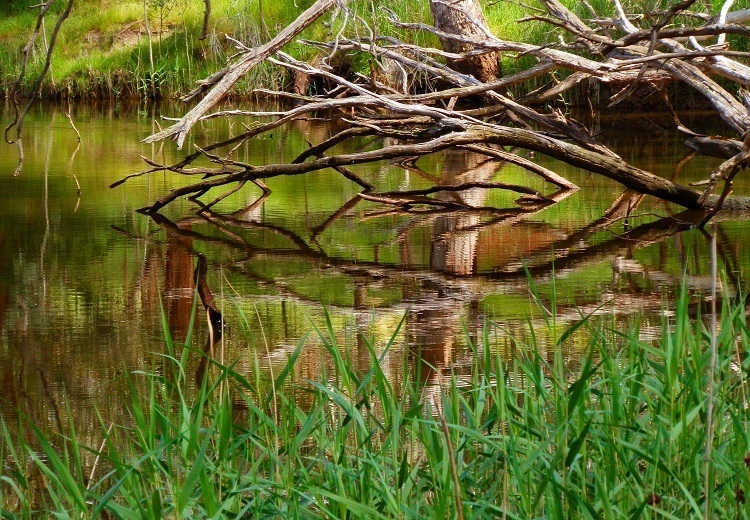 It’s only a log … no crocodiles at Nigretta Falls, Victoria! I’ve even passed through all five Precincts – Craters & Limestone; Plateaus and Falls; Coast & Caves; Cones & Flows; and Lakes & Craters – although I’ve only explored attractions in three. But here’s a random selection of what I’ve discovered so far on the Kanawinka Geotrail! ‘… stop! Stop!! STOP!! !’ Pilchard shouted as I strode ahead of him round the Lake Suprise circuit trail just above the high water mark. I nearly ignored him. He’d probably just seen another bird fluttering through the trees lining the slopes of the Mt Eccles crater towering above us. But I stopped anyway, sighing audibly with foot poised in mid-air in my very best ‘Girl Interrupted’ pose. Something slithered under the dry grass at the edge of the track where my foot was about to land, dislodged a pebble or two, and hit the water with a plop. Was it any surprise the snakes were about on this warm spring day? If I’d actually seen it, there’s no way I could have finished the 2km hike around the Crater Lake’s waterline. 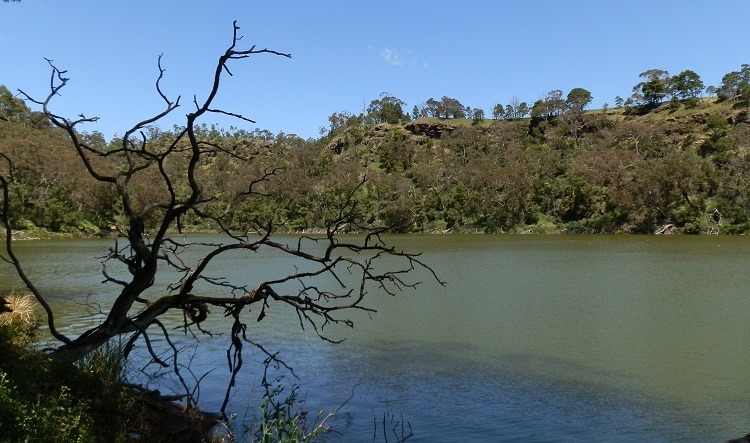 Which would have been a shame because the crater lake surrounded by cliffs and wooded slopes was a fantastic introduction to the fascinating Mt Eccles, whose lava flow created ponds, wetlands and lakes managed by the Gunditjmara people to form Australia’s first aquaculture initiative! I’m not sure what REAL surprise Lake Surprise was named for – but I hope it was more pleasant than mine! One of the advantages of a flat, treeless plain is that a killer view doesn’t require much elevation, so a smallish extinct volcano will do the trick! But although this scoria accumulation rises 100 metres to tower over the tiny town of Penshurst and has the longest lava flow in Victoria, the awesome view from the summit of Mt Rouse gives no indication of the treasure below, hidden away in the town’s back streets. Although it’s only a treasure if you’re a sucker for second hand books like I am! Ruriks Shed is the equivalent of a magic kingdom for bibliophiles – all the better for being completely unexpected AND in the shadow of an extinct volcano! Cool!! While it’s unlikely to start erupting again anytime soon according to the nearby Penshurst Volcanoes Discovery Centre, its looming presence visible throughout the town is a reminder of the violent forces that once shaped this part of Australia. ‘Are they worth seeing?’ the older gentleman accompanied by a younger woman and two small children asked as we held the gate open for them at the Byaduk Caves carpark. Now, how was I supposed to answer that without being a mind reader possessing more tact than I’ve ever been known for? An intriguing system of sinkholes, lava tubes, domes and chambers, the Byaduk Caves formed when a fountain of lava erupted from nearby Mt Napier, highest point in this district, and youngest volcano in Victoria. Fascinating, if the resident colony of Bent-winged Bats didn’t bother you. Or the possibility that the large snake we saw on the road in to the Caves complex wasn’t a loner. So leaving questions like whether the family group were locals and accustomed to the area’s hazards; whether or not the kids were up to a hike through the long, dry grass; and indeed whether they would find a few holes in the ground as interesting as I did; aside, I took the easy way out. ‘We thought so,’ I replied! 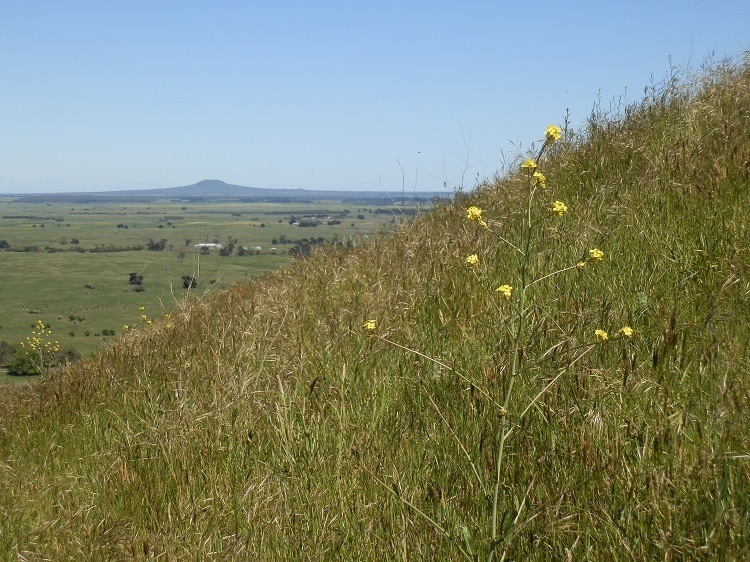 Not far away, the Tumuli, also called Lava Blisters, were surrounded by long, dry grass. Just getting out of the car for a photo was enough to put me on full snake alert after the excitement of Mt Eccles. Mt Rouse wasn’t the first extinct volcano I’d visited. 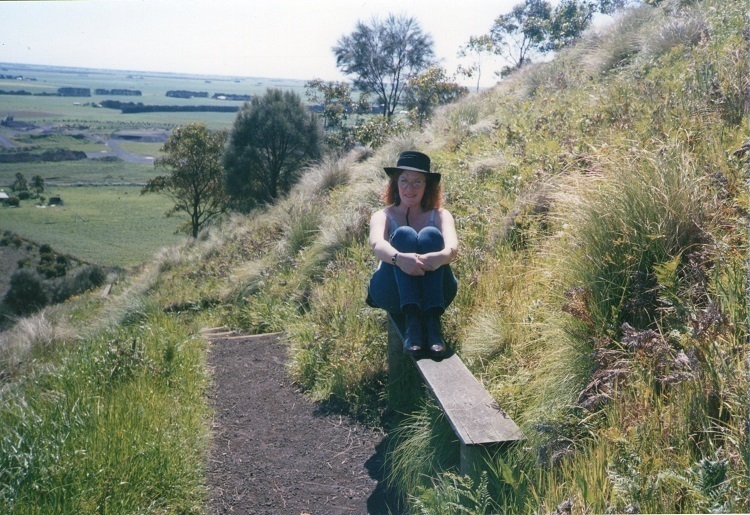 Way WAAAAY back in the dim distant past – when I was nearly HALF the age I am now – I climbed Australia’s youngest volcano with my then flatmate on – yes, I was even doing it way back then – a road trip passing through Mt Gambier! But living in a pre-Facebook and pre-digital photography world – yes, those were dark times – didn’t stop us from taking the equivalent of today’s ‘selfies’ as we wound our way up the 159 metre elevation to the top of Mt Schank to look down into the crater. Current tourist information talks of the marvellous summit views across the limestone plains, complete with lava flows, but those clearly passed us by with our own selves front and centre in ALL the photos of this trip! And there’s other differences between my current and past selves – next time I go to Mt Schank, I’ll SO be doing the crater floor walk!! My then (thankfully now LONG-ex) boyfriend – lets call him David – and I were on a mini-break. A 4-day road-trip to South Australia’s South-East, and I was ready for some sightseeing. Well, that’s why I travel to new places! Not David. A bit of wacky ‘baccy in the hotel room, and a few drinks at the local pub was what he had in mind. He’d tried to cut the holiday short at the last minute citing lack of funds (those baggies don’t come cheap), but I cleverly managed to persuade him to take the whole 4 days by agreeing to pay for everything, thus avoiding a costly cancellation fee. In return, he dutifully ‘agreed’ to ‘pay me back later’!!! Two words. ‘Young’ and ‘Silly’. I have a few (perhaps presciently blurred) photos of this momentous, but long ago holiday so one of us must have had a camera, but who actually took this GOOD photo of the inside of the Tantanoola Cave remains a mystery. I may have bought it from the kiosk (if anyone from the Tantanoola Cave recognises it, please let me know so I can give appropriate credit). David wasn’t that interested in the cave, despite the scenic splendour of (what I now know to be) its pink dolomite caverns and unusual speleothems. But with the benefit of hindsight, I suspect he just wasn’t that interested in me. But that’s OK. I got the best end of the break-up deal – I got to keep the road trips!! 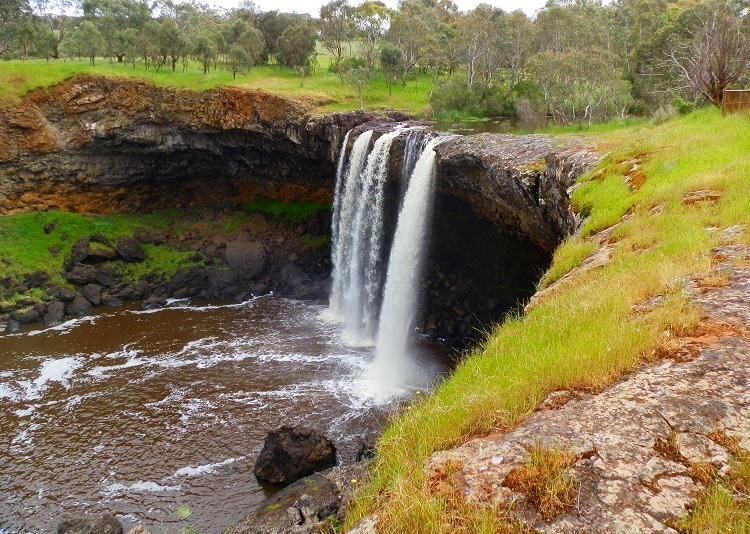 The first time I visited Wannon Falls, I didn’t take a photo, despite the impressive flow of water over the 30 metre high precipice. The second time I went there, I was fascinated by The Taxpayers Reward – a not-so-scenic public toilet erected as part of a previous prime minister’s ‘Nation Building’ program! But on my third and most recent visit, I’d just discovered it was part of the Kanawinka Geotrail – which gave my (endless) photographic recording and inspection of its points of interest far more gravitas! So now I can tell you the river follows an ancient lava flow. This photo (above) from Pilchard’s archive shows that not much changes at Wannon Falls apart from the amount of water and access to the bottom of the falls. But his interests have changed too – instead of the waterfall, he was (unsuccessfully) scanning the tree tops, as the picnic ground is a known Powerful Owl habitat. But we were both fascinated by the water at nearby Nigretta Falls, upstream, and part of the same river system. Absolute virgin territory (ie the first visit for both of us) these falls are supposedly on the site of a super volcano!! Whether or not that is so, the falls and river above make a splendidly scenic spot to explore, have lunch or just hang out. The best adventure is sometimes the one you haven’t had yet. 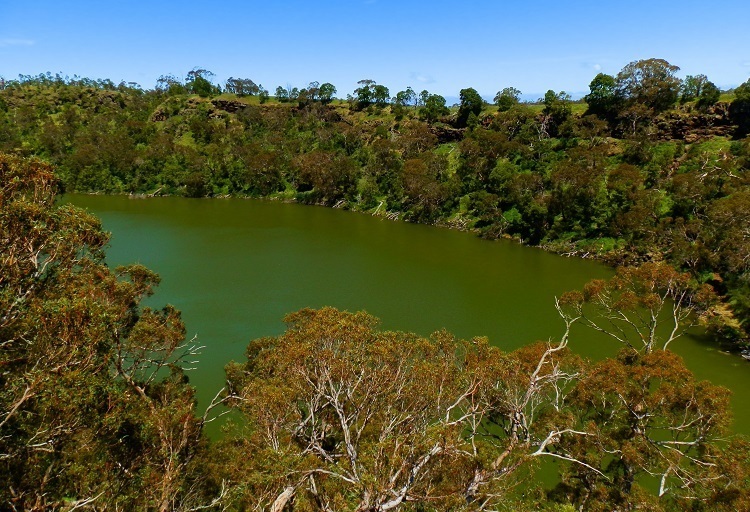 Over the years, several road trips have taken me through Mount Gambier, in South Australia’s South-East, and site of the intriguing Blue Lake. And if Blue doesn’t do it for you, the neighbouring slightly-less-blue lake (see below) has been imaginatively dubbed Green Lake (aka Valley Lake)!! But other than buying a bottle of Blue Lemonade and taking a couple of photos – the above happily during November to March when the Blue Lake is at its bluest; there’s no corresponding period for when the Green Lake is at it’s greenest – the region remains a relative mystery. 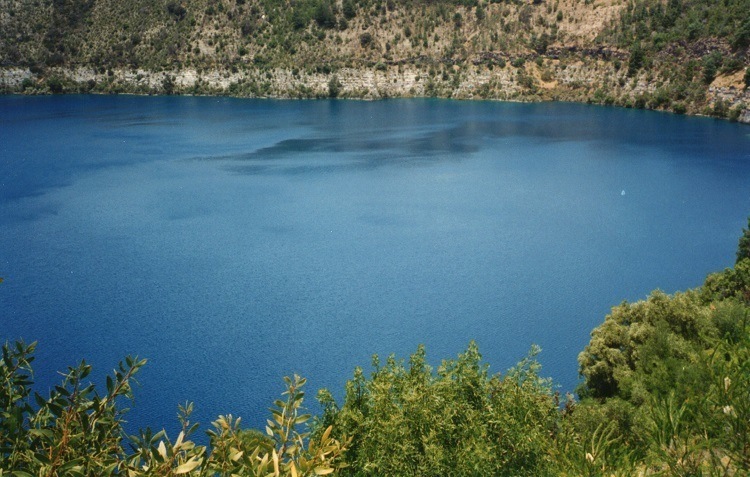 SO … exploring the Blue Lake, Green Lake and neighbouring Crater Lakes complex remains firmly on the to-do list. PS Yes, we’ve now explored the Limestone Coast a bit more thoroughly, including even MORE Kanawinka GeoTrail attractions. See below for the link! « P is for Patriotic: 26 Reasons to ROCK Australia Day! 1000 Words About … Pedestrians Crossing! G’day Red! Just checking in to (firstly catch up on posts I haven’t seen!) I’ve been rather slack around blogland lately, and secondly just to see if all is ok in your world – I see you haven’t posted for a while. So, good wishes to you and Pilchard. Wow. Your nature pictures are stunning. Impressive and attractive photos. I love nature. In Australia there are really lots of scenic areas to visit. Lovely photos, as always. You really get around! I think that Mt. Abrupt is the coolest name for a mountain ever, BTW. So many beautiful places to see in Australia, I for one would have a hard time picking if I were to venture a trip down under. I love that last photo of Nigretta Falls. That cavern shot makes me think of Carlsbad Caverns in New Mexico here in the states. I haven’t been there in years but the cavern is huge and has many scenes like the one you’ve shown here. What a fantastic trip you are having, great pics and an enjoyable read. Wow. Great pictures. Looks like a great place to hike. Is it possible to do it all on foot? I know what you mean about past relationships. At least you do keep the experiences. The Geotrail sounds like a great driving/hiking adventure. Your photos are wonderful, and as much as I enjoy waterfalls, I don’t think I could pick out a favorite part of the trail. 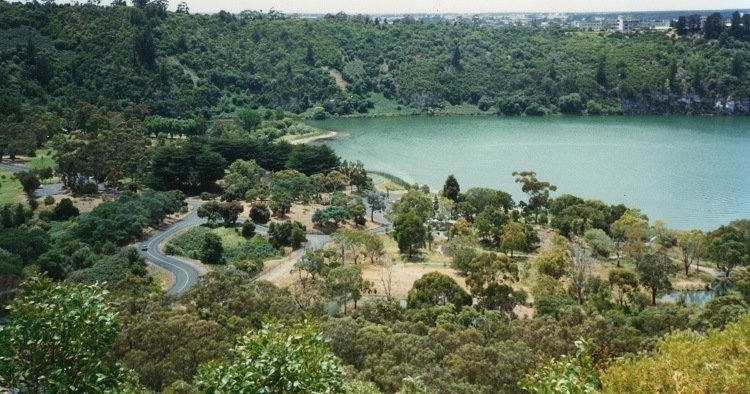 Only place of these we´ve been was the Tantanoola Cave in 1995, oh and blue and green lake Mt Gambier – oh, time so runs! And – not kidding – we just talked about that trip on the weekend (well, not the Cave, the whole trip). Wow for the rainbow at Wannon Falls – so beautiful! Love it! Thanks for sharing, Red! I was freaking sure it was a gator waiting to pounce! How’s the hood Red? Loved this post! The Geotrail – fascinating! Those falls, caves, gorgeous green Lake Surprise and Blue Lake… beautiful! All added to the “must go to” list. Margaret River, W.A. has some amazing caves that are stunning! Loved reading about the volcanoes. I’m fascinated by earthquakes. We’ve had a few small ones here, recently. I read that, “two separate geological studies have concluded that an area from Adelaide to south-east Victoria is seismically active”. And, “University of Melbourne geologists have uncovered evidence that parts of South-eastern Australia recently stirred from their geological slumber and are in an active mountain building phase. These mountains are being shaped by earthquakes, some reaching greater than 6 on the Richter scale”. I would love to read more about the Newer Volcanic Province of Victoria and southeast South Australia, which suggest the possibility of further activity by “young volcanoes”. Very interesting. great pics, road trip, and story to go along with it Red. I am yet to travel through much of the Eastern States. Yep, finding someone who likes road trips is definitely a bonus for you! and me too.You have got a couple of good waterfall pics there. Sometimes we could be standing on crater sites and never know it. Have you been to any of the craters in the NT? Have a great week Red. A very interesting post. I have never heard of the Kanawinka geotrail before even though I have visited some of those places. “We thought so” is always the best answer. I love Tantanoola Cave, it’s gorgeous! Nice to know that the Blue Lake is bluest between November and March, I’ll add that information to the bus time table I have for that area. I’m planning a visit, probably 2015. Red, thanks for sharing your great trip and photos, and a bit of history about you! It looks like a great goal to visit all of the sites on the geotrail. wat is dat geweldig mooi wat een natuur wat een weelde om in z,on mooi land te vertoeven. Great scenery. I’m afraid I am a more ‘green’ person than red. The Wannon Falls seem to have more vegetation than they used to. When you see the Blue Lake, it is worth taking the power station tour. Glad to see you are branching out to a new color. In this case Green. I was starting to wonder if you were actually reporting from Mars. The waterfalls and caves are lovely. Haven’t explored Victoria as it’s always too cold when we travel in winter. Wow, so many beautiful sights to see. The log did look like a croc! The waterfalls are beautiful. And my hubby would love to visit the caves. Wonderful photos, have a happy weekend! For someone so self-deprecating about her skills as a photographer, Red, you certainly share a lot of stunning and top quality photos. I’m especially happy to see your photo from Budj Bim – the Lake Condah region is one I should certainly add to my bucket list. It’s part of Gunditjmara history. Permanent stone dwellings which predate European settlement can be seen there, and traces of a life based on aquaculture.